After San Francisco, California my 2012 USA west coast holiday continued on the Amtrak Coast Starlight train to Seattle, Washington State. photo set contains my highlights of the journey. It should be emphasised that catching Amtrak is about the journey and who you meet along the way. Delays can and do occur due to weather, other train traffic along the route and injuries/fatalities if someone collides with the train. Do not make firm plans on the same day you’re due to arrive at your destination to meet friends for dinner, catch a connecting flight etc. In return you’ll get to sit and watch the landscape roll pass as the Amtrak Coast Starlight train passes through California, Oregon and Washington State. Book by phone so you can ask for a sleeper roomette in the middle of the carriage on the top level and on whichever side left/right the customer service agent thinks will be more scenic. My journey began at San Francisco’s Ferry Terminal building where I caught an Amtrak bus to Emeryville station. When we reached there it turned out that the train was going to be delayed going north as it’s sister train heading south the day before had hit a cyclist trying to cross the tracks in the wrong place. We finally got onboard the train and left Emeryville station at 1130pm, one and a half hours late. I had paid extra so the train attendant showed me where my First Class sleeper accommodation Roomette was located. 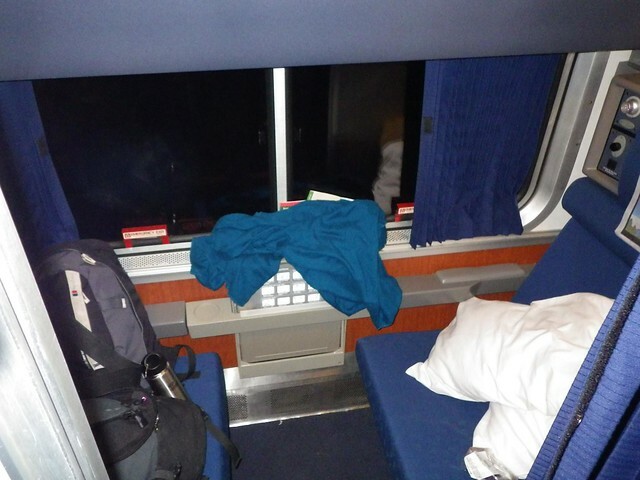 There’s a reason why it’s called a Roomette and that’s because it’s a very small space. By night it’s top and bottom bunk beds and by day gets folded up into two comfortable seats facing each other. I’m 190cm / 6ft 3″ in height and the only way I could sleep was lying sideways on the bigger bottom bunk with my legs folded up a bit. Since I was travelling by myself I stashed my main big travelpack and smaller day backpack on the bunk above. If you were travelling as a couple, then there would be very little space for any luggage within the Roomette besides a small bag for each of you to pack your PJ’s, toothbrush etc in. Make use of the first class facilities such as the movie room, separate parlour viewing/dining car, shower, restroom. 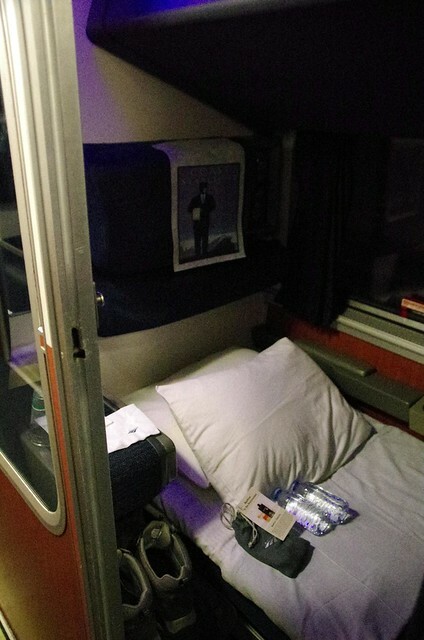 Amtrak staff work long hours and if the train is late often have to turn around and do another long shift in only a few hours time so tip them if they provide you with good service in setting up your bed, answering questions, serving meals with a personal touch etc. Note that the Roomette locks from the inside but not the outside. If you are leaving the Roomette unattended to go for a meal or look out of the viewing carriages then take all your valuables (wallet, phone, camera etc) with you. 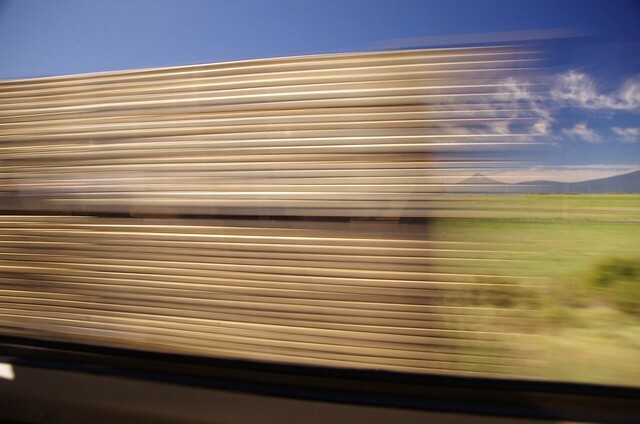 Regarding technology: If you’re taking photos through the train windows you can remove/reduce the glare/reflections by using a polarising filter on a Digital SLR camera. Mobile phone coverage is patchy regardless of which network you are on. There is a 120V charger socket in each roomette so bring a double adaptor and converter if your gadgets are like you, from overseas, the parlour and sightseer carriages both have lots of 120V charging sockets. In the morning I awoke to the sight of the train passing the Cascade Range of mountains. While I was at breakfast the Amtrak train attendant converted the bunk beds into chairs. 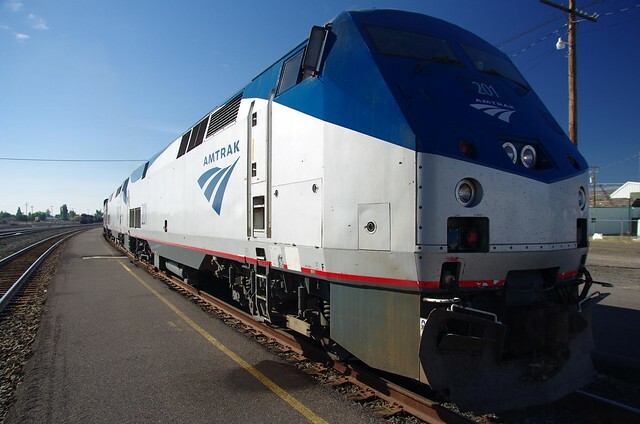 Amtrak passengers with sleeper accommodation have breakfast, lunch and dinner included in their ticket price. Coach (seat only) passengers can buy the meals, bring their own food onboard or buy snacks from a small cafe in their area of the train. 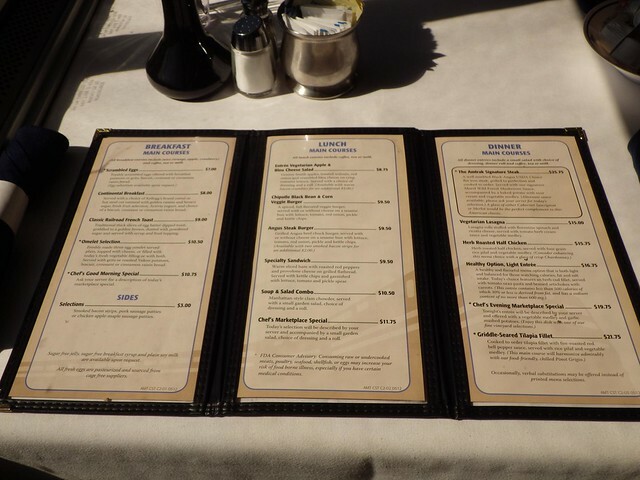 Either way the dining car menu for all three meals is below. Book lunch and dinner early so you can be in the parlour and not eat late when there are fewer meal, drink and dessert options because everyone else has chosen the popular ones already. Coffee and juice are available from opposite the upstairs restroom in your sleeper car. I found it easier to use a stainless steel drink bottle and refill that from the coach cafe section wall dispenser. 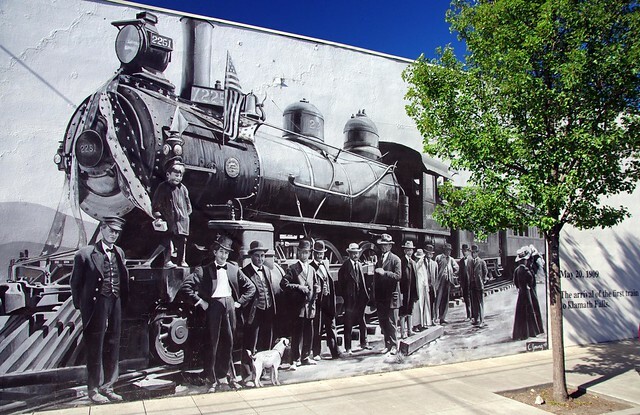 After breakfast we reached Klamath Falls, Oregon where the train stopped for a crew rest and further delay. I took the opportunity to go for a walk around the small town, passing signs promoting political candidates for the upcoming US elections and watching Boeing F-15 Eagle Fighter Jets from the Oregon Air National Guard fly overhead. 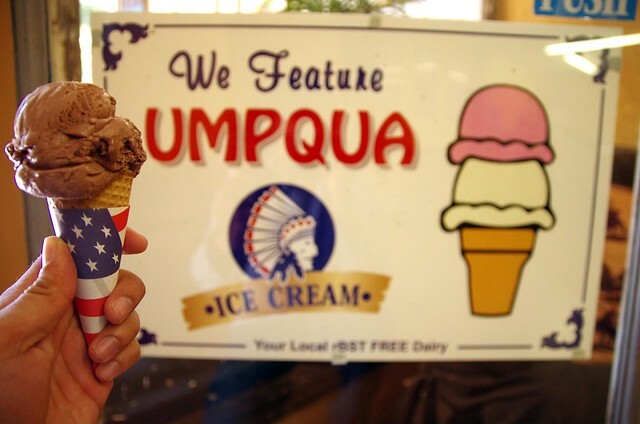 After looking at a few examples of street art explaining the history of Klamath Falls I found a local shop that sold Umpqua icecream made in Oregon. After walking back to the Klamath Falls train station I took photos of the Amtrak locomotive (GE P42DC #53057) before we left the station with a few deep toots from the train’s horn. While on the train it is easy to just stare out the window but if you make an effort to say hi, most people are very friendly. 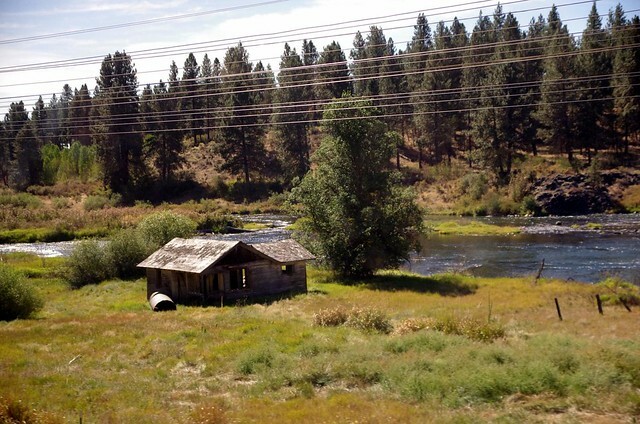 I had conversations with all kinds of people including a US Military Veteran from the Vietnam War who had survived exposure to Agent Orange, Oregon college students and various retirees who were travelling on Amtrak for leisure. 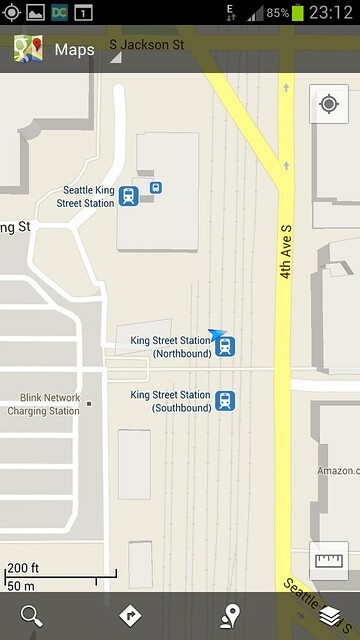 Before you know it the train will be pulling in to Seattle’s King St Station in the evening and you’ll have to say bye to the people you have met before moving on to your next adventure.